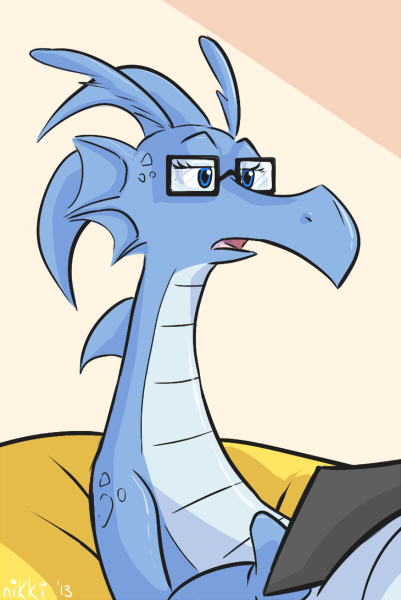 A frustrated young dragon currently occupying the blurry boundary between late adolescence and adulthood. A “late bloomer” in many ways, his thoughtfulness and sensitivity would be downright crippling were it not for the gusty energy with which he expresses them. He has almost completed his schooling, and has absolutely no idea what to do next. All he knows for sure just now is his desire to finally, finally learn how to use his wings and fly. 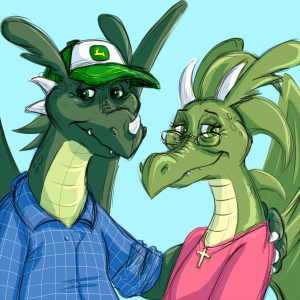 Tater’s best friend, and one who knows his frustrations as a dragon who was in the same place in her life, not long ago. 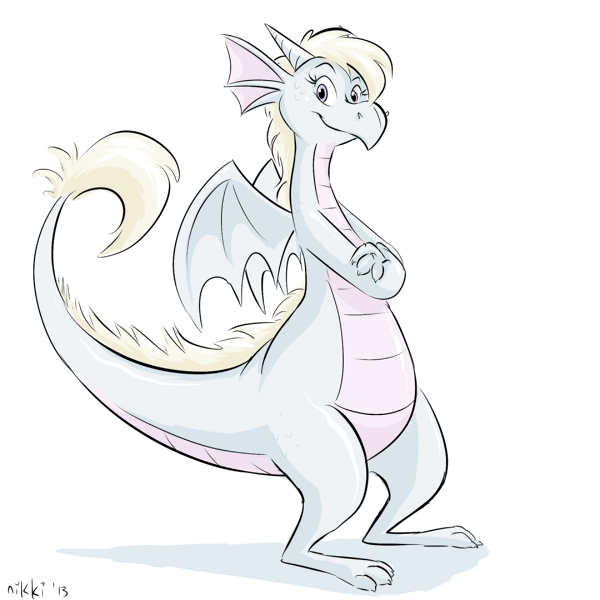 A few Dragon Years older than he, Drizzle is an aspiring artist (of some kind or another) who finds herself, fresh out of the nursery of youth, knee-deep in the same predicament as most young adult dragons: well-educated and under-employed. She struggles to make her artistic voice heard and pay the rent on time, while counseling Tater full-time. Drizzle’s older sister and her main source of support outside of Tater. Just enough older than Driz to have been places she hasn’t yet, but not so much older that they can’t have semi-weekly sleepover-movie-nights and paint each others’ claws. A successful artist by trade, and someone Drizzle aspires to be like. Rain’s mate-for-life. A wyvern with a high technical proficiency and a nigh-on-indeterminate gender. Tater’s parents. They’re entering retirement age – or they would be, if it had stayed where it was a century ago. As it stands, they’re stuck with an empty nest they can’t seem to flip for the price of a decent cheeseburger, and a slowly failing family business. If we’re being poetic about it, they may just represent the twilight of the Baby Boomer generation as a whole. Er…You know, the dragon Baby Boomers. 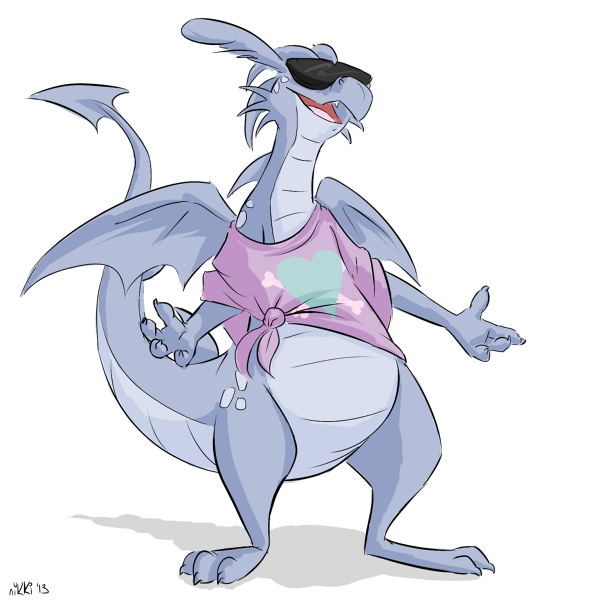 Drizzle’s close friend going way back. 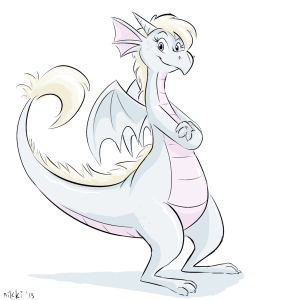 A kindred spirit whose family still takes the concept of Dragon Royalty seriously, despite the complete oversaturation of self-proclaimed princes, princesses, kings, queens, dukes and duchesses that overwhelmed dragon society many centuries ago. That picture of Tater made me melt when I first saw it. 🙂 For some reason, I expected him to be colored red.